More details of the 14th Hamptons International Film Festival were released Wednesday by organizers. As previously unveiled, the festival will open with the world debut of Philip Haas‘ “The Situation,” a thriller, romance and war movie set in contemporary Iraq, starring Connie Nielsen and Damian Lewis. This year’s full lineup includes 114 features and shorts, with 15 world, 15 U.S., eight North American, 20 East Coast and 13 New York premieres slated. Other highlights include honors for actress Ellen Burstyn, “The Fountain” director Darren Aronofsky and producer Ted Hope, while director Robert Altman will participate in this year’s “A Conversation With” series. Closing out HIFF, which takes place October 18 – 22, is the East Coast premiere of Mike Polish‘s “The Astronaut Farmer,” written by Mark Polish. 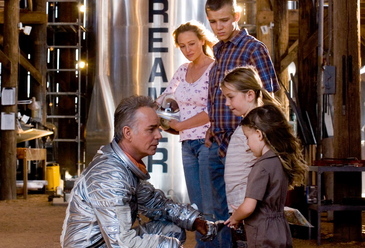 The film stars Billy Bob Thornton as an astronaut who is forced to leave NASA in order to save his family farm, but maintains his desire for space travel by embarking on a project to build a rocket inside his barn. HIFF will screen 18 films in competition as announced in indieWIRE in late August with six narrative titles vying for the festival’s Golden Starfish Award, which includes over $190,000 in goods and services for the winner. In addition to the festival’s narrative, doc, shorts, and films of conflict and resolution competitions (consisting of films that portray war and upheaval around the world), HIFF will screen eleven “Spotlight Flms.” Included in this mix are the East Coast premiere of Neil Armfield‘s story of a junkie, “Candy” starring Heath Ledger as well as Joseph Greco‘s world debut, “Canvas” about a father and son who cope with the mental illness of their mother. In Sue Kramer‘s “Gray Matters” (East Coast Premiere) siblings Gray (Heather Graham) and Sam (Tom Cavanaugh) do everything together. They jog together, they watch old movies together, they ballroom dance together, and they fall for the same “perfect woman.” “The Hawk is Dying” (East Coast premiere) by Julian Goldberger and produced by Ted Hope, stars Paul Giamatti as a custom auto shop owner who dreams of falconry. Also in the HIFF’s “Spotlight” is German director Margarethe von Trotta‘s U.S. premiere, “I Am The Other Woman,” about a businessman who sleeps with a prostitute, and is surprised to find her at a reputable law firm the next day. Bruce Weber joins the section with “Let’s Get Lost,” a look at elusive jazz vocalist and trumpeter Chet Baker. German director Hans-Christian Schmid‘s “Requiem” is the story of a deeply religious young woman whose demonic visions happen to coincide with her immersion into secular university. The “Spotlight” roster also includes Marc Forster‘s “Stranger Than Fiction” with Will Ferrell, Emma Thompson and Dustin Hoffman, the world debut of Steve Stockman‘s bittersweet comedy/drama “Two Weeks,” Harry Moses‘ “Who the $#%& Is Jackson Pollock,” the true story of a retired truck driver who buys a Pollock painting at a thrift store for five dollars, and Oren Rudavsky‘s “The Treatment, starring Chris Eigeman, Famke Janssen and Ian Holm. A scene from Mark Polish’s “The Astronaut Farmer,” which will close the 14th Hamptons International Film Festival. Image courtesy of the festival. The festival’s World Cinema Features are: Eric Byler’s “Americanese” (U.S., East Coast premiere); Daniele Thompson’s comedy “Avenue Montaigne” (France’s official entry for foreign language Oscar consideration); Paul Sapiano’s “The Boys and Girls Guide to Getting Down” (U.S., East Coast premiere); Argentine film “Cronica de Una Fuga” (New York premiere) by Israel Adrian Caetano; Argentine director Daniel Burman’s “Family Law“; Jake Clennell’s “The Great Happiness Space” (U.S./U.K., New York premiere); Philip Groening’s “Into Great Silence” (France/Switzerland/Germany); Macky Alston’s “The Killer Within” (U.S., U.S. premiere); David Carl Lang’s “Mentor” (U.S.); David Lammers’ “Northern Light” (Germany, U.S. premiere); Pernille Fischer Christensen’s Berlinale ’06 Silver Bear winner, “Soap” (Denmark); Stefan Krohmer’s “Summer 04” (Germany, U.S. premiere); Stefan Faldbakken’s “Uro” (Norway, North American premiere); Niels Arden Oplev’s “We Shall Overcome” (Denmark, U.S. premiere). In other festival highlights, actress Ellen Burstyn will receive HIFF’s Golden Starfish Award for career achievement in acting, while the festival’s “Industry Toast” will spotlight producer and This Is That founder Ted Hope (“American Splendor“). Rosie Perez will serve as “toastmistress” for the event, which is co-presented with indieWIRE. Rolling Stone‘s Peter Travers will moderate a chat with Robert Altman as part of the festival’s “A Conversation With…” program. Past guests have included Kevin Bacon and Kyra Sedgwick, Gena Rowlands, Anthony LaPaglia, Martin Scorsese, Steven Spielberg and more. And, Darren Aronofsky’s latest effort “The Fountain” will be honored with the seventh Alfred P. Sloan Foundation Film Prize in Science and Technology. The award honors feature-length work that “explores science and technology themes in fresh, innovative ways.” The prize also includes $25,000. HIFF will also return with its Rising Stars program, which spotlights emerging acting talent. This year’s participants include: Carmen Chaplin (“Day on Fire“), Matt Davis (“Mentor“), Dagmara Dominczyk (“Mentor”), Noah Fleiss (“Day on Fire”), Mido Hamada (“The Situation”) and Sandra Hueller (“Requiem”).